President Barack Obama gestures as he answers question from members of the media during a news conference in the State Dining Room of the White House in Washington, Oct. 2, 2015. President Barack Obama has apologized to Doctors Without Borders for the U.S. bombing of the international medical charity's hospital that killed 22 people last weekend in Kunduz, Afghanistan. White House spokesman Josh Earnest said Obama called the medical group's president, Dr. Joanne Liu, to "apologize and express condolences." In a statement issued Wednesday afternoon, Liu acknowledged receiving Obama's call, but repeated her earlier demand for an independent panel to conduct an investigation under the Geneva Conventions, "to establish what happened in Kunduz, how it happened and why it happened." Taliban insurgents have taken parts of the northern Afghan city of Kunduz, while the provinces of Nangarhar and Paktika suffered attacks from the Islamic State over the weekend. MSF has suggested that the bombing could be considered a war crime, but White House spokesman Earnest said "no one has offered any evidence that it's anything but a terrible, tragic mistake." 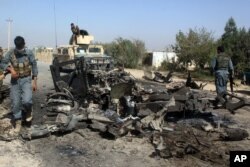 Obama also called Afghan President Ashraf Ghani to voice his condolences for the innocent loss of lives in the aerial bombardment Saturday, the spokesman said, and to commend Afghan forces for their bravery in the fight to control the northern Afghan city in clashes with Taliban insurgents. 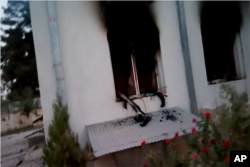 Associated Press video footage of the burned-out hospital compound in the east of Kunduz city. The top U.S. commander in Afghanistan, Army General John Campbell, says the United States is taking the blame for carrying out Saturday's raid after Afghan forces requested it to attack Taliban insurgents it believed were firing from inside the medical facility. But the question remains whether the U.S. should have agreed to the attack. FILE - Afghan security forces inspect the site of a U.S. airstrike in Kunduz city, north of Kabul, Afghanistan, Oct. 2, 2015.